While in the Leads section of your admin panel, you can access your leads from either the Overview tab or the List of Leads Tab. This following will cover leads submitted through your standard lead capture forms. Form 1003 specific leads can be viewed under the Form 1003 Tab which you can read more about here. From the Overview tab you can access leads that are from a specific form on your website. Click the green View button next to the form that you wish to view leads for. This will take you to the List of Leads tab, with results filtered by that particular form. 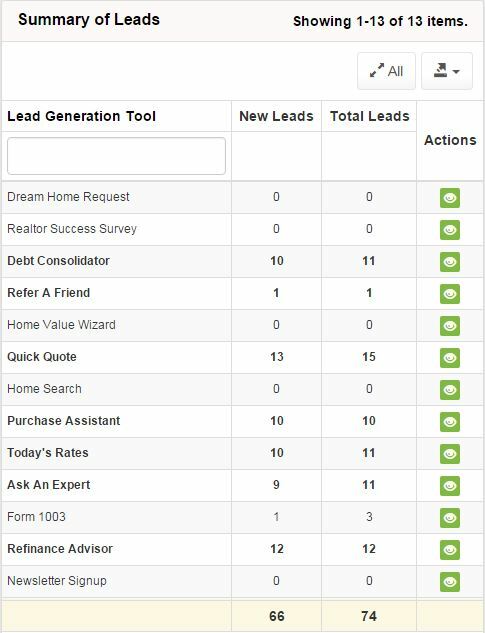 Once there you can click the Reset Filters button to view all of your leads. From the List of Leads tab, you have access to view, delete, add, assign, email, and export your leads. New leads appear in green and will have the symbol under the viewed column. Leads that have been viewed, will appear in white and the symbol will appear under the viewed column. Leads can be filtered by making selections from the various drop downs under each column title. If you would like to make all leads visible again, click the blue Reset Filters button to remove any filters you have applied. To view lead information, you can click the green View button under the actions column, or you can click directly on the lead itself. The lead screen will show you the Contact Information for the lead, as well as the Lead Information submitted. Clicking the Blue bar will expand or collapse that section of the lead. From this screen you have the option to Assign the Lead, Go to the Contact page for this lead, and Export the lead information to a PDF. To delete a single lead, you can click on the Delete button under the actions column. If you want to delete multiple leads at once, click the check boxes next to the leads you wish to delete, and click the larger Delete button above the list of leads. Selected leads will appear in red. You can assign leads by clicking the check boxes next to the leads you wish to assign, and clicking the Assign Leads button above the list of leads. You can also View a lead and click Assign Lead(s) while viewing the lead. After clicking the Assign Lead(s) button the selected leads will be listed. If you need to remove a lead from the list of leads to be assigned, click the red X next to that lead. To assign the leads, select the staff member you wish to assign the leads to from the drop down list, and click the green Assign button. You can quickly send an email to your leads by clicking the blue Email button under the actions column. You can add a lead by clicking the Add Lead button. This will allow you to complete the Quick Quote from the admin panel. Your list of leads can be exported in a few different formats including Excel, PDF, Text, CSV, and HTML. First, select the fields you wish to export from the drop down list next to the Export All button.